Halloween may have passed by a few months ago, but it is never too late to revisit an old gaming classic, Transylvania. 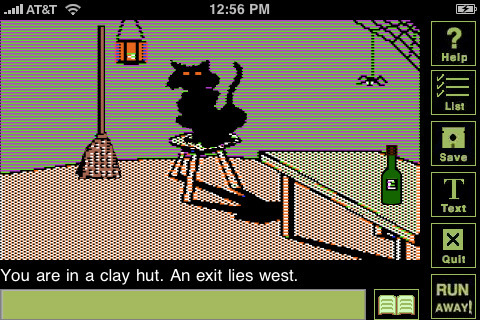 Created and released in the 1980s by Antonio Antiochia, it is now called Transylvania Adventure in its iPhone adaptation by RetroVenture (which the original developer had a hand in, as well). Like the first game, you are to rescue the Princess Sabrina from a countryside where supernatural creatures roam free–or else she dies at dawn. Much of the gameplay remains the same, except for one huge difference: the multi-touch screen offered by Apple devices. 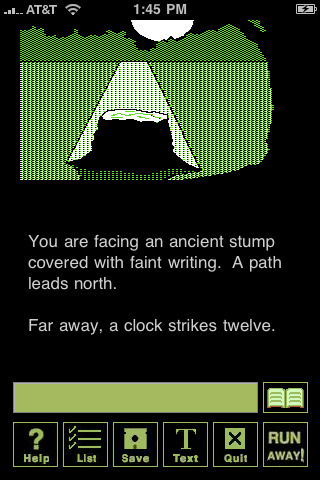 You still wander said countryside, picking up clues and defeating foes, but instead of just typing in all the commands, you can also direct the character’s choice of paths and actions through tapping. Simple, mostly static scenes show up on the top half of the screen, while descriptive text scrolls through below. Everything is laid out for you in the text, including setting descriptions, the moves you make, and the pathways that you can take; feel free to scroll through past text by flicking down. The game is a sort of choose-your-own-adventure, with you making the decisions about what to do next based on the text. You can type out the directives in the green text field (in the form of verb-noun commands like “go north”), but sometimes finding the right combination of words is hard. The easiest way to get around this is to use the dictionary (tap the book icon to the text field’s right). Choose the best words from both columns and see where/what they get you. It can turn out to be unintentionally hilarious or–if you’re lucky–actually helpful to your quest. Another way you can interact is by tapping on the scene directly. Only objects that are relevant will be interactive: tapping on them and holding for a few seconds will bring up a menu of options. The toolbar at the bottom should be used often, especially the Help button. Tapping it will bring up a host of beneficial guides, including the Tutorial. Be sure to hit the Save button before you fire up the tutorial, though–loading the tutorial will force you to restart the game from the beginning. The Text button switches the screen from graphics to all-text, so it’s easier to read through. The all-important Run Away! button should be utilized whenever you can’t get out of a scrape with what you have, but be careful: things that go bump in the night tend to follow you around. The retro graphics (hurray pixelated black-and-green theme!) and cheesy sound effects might be a huge throwback, but please don’t let that fool you or lure you into complacency. This game can be extremely frustrating, especially for those who aren’t detailed and thorough. Not only do you have to find objects, but you must figure out how to use them either in conjunction or on its own, and when. An added level of difficulty is in the randomization of events and objects each time you try to play through the game: you never know when a werewolf will jump out to clamp its jaws around your throat. Transylvania Adventure requires patience, deliberation, and creativity. But don’t spend too much time mulling over your prospects–the Princess only has till dawn. AppSafari review of Transylvania Adventure was written by Julie Guan on January 13th, 2011 and categorized under Adventure, App Store, Fun, Games, iPad apps, Puzzler, RPG, Strategy, Time Management, Universal. Page viewed 4878 times, 3 so far today. Need help on using these apps? Please read the Help Page. You got wonderful site.I am big fan of all apple products and talking about iphone is all i like.